In The Opening Game, The Middle Game, and the Endgame, I compared the structure of financing retirement to the structure of a chess game. Having covered The Middle Game in my last post, I'll describe retirement's Endgame in this one. The Endgame is dramatically different than the Opening game. 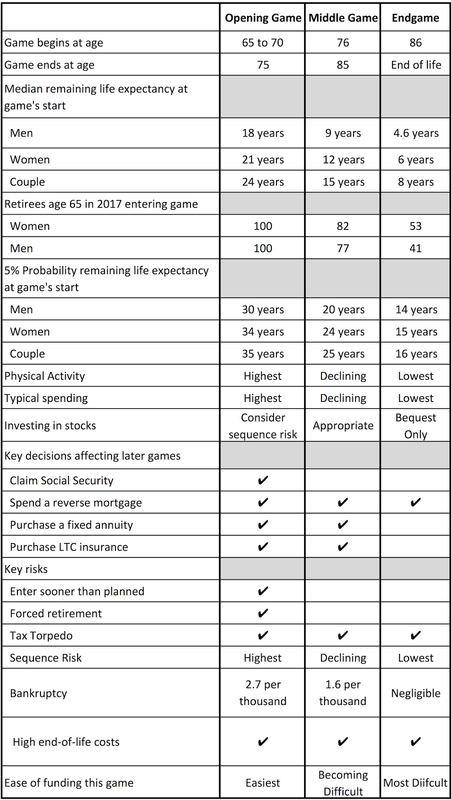 The typical retiree has changed from a mentally sharp, physically active person with many decisions ahead, many options from which to choose, and an enormous range of potential outcomes in the Opening Game to one who is typically less active, perhaps has lower mental acuity and less interest in finance, has already locked in most of the important financial decisions, and whose range of potential outcomes has narrowed. Expecting to establish a strategy at the beginning of retirement that is optimal for both of these scenarios and one between is often a fool's errand. Following is a simplified state diagram for visualizing the narrowing of options. At the beginning of retirement, the retiree has the most options. Initially, any of the blue circle "states" are possible in the future depending on the retiree's decisions and factors beyond her control, like her health and market returns. The retiree follows the decision path in black (below) and arrives at the Middle Game. It may help to think of each row as a year. 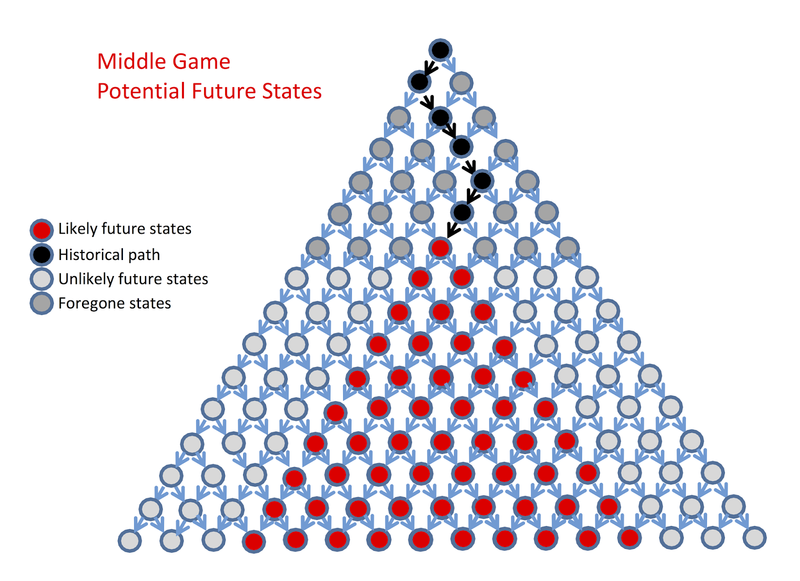 By the Middle Game (the row with one red circle), many future outcomes (light gray) are no longer likely to be achieved. A retiree who nearly depletes his portfolio by the Middle Game, for instance, makes ending retirement at a state that includes an enormous portfolio less likely, though not impossible. Some future states may be impossible to achieve because, for example, the retiree's Social Security claim has already been finalized or Long Term Care insurance was or was not purchased and no longer can be. Once a retiree claims Social Security benefits at age 65, for example, all future states in which the retiree claimed at a different age are no longer possible. In other words, future Social Security benefits were locked in at age 65 under current law. The retiree's range of possible final outcomes is represented by the bottom row of the pyramid. There are fewer red circles in that row than there were blue circles in the bottom row of the Opening Game pyramid above, indicating that the range of likely final outcomes has shrunk as time passed and decisions were made. Several more decisions bring the retiree to the Endgame, where the range of possible final outcomes and the number of available options is the smallest, yet. One benefit of breaking down retirement into sub-games is that it enables us to consider these different life stages simultaneously. 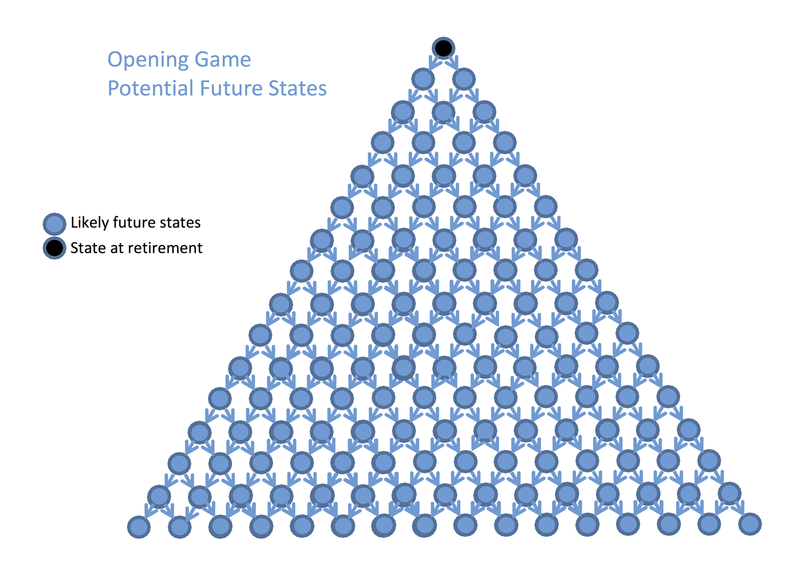 Comparing the Endgame side-by-side with the Opening Game, for example, clarifies why retirement planners often recommend delaying Social Security benefits. Households that delay claiming and live into the Endgame will have a larger floor of Social Security benefits late in life. Delaying also lowers income in the Opening Game and visualizing the two stages side-by-side provides a clearer understanding of the tradeoffs. In retirement's Endgame, the range of possible final outcomes and the number of available options is smallest. I set the beginning of the Endgame at age 86, again somewhat arbitrarily. It ends when there is no surviving spouse. The median remaining life expectancy for an 86-year old male is about 4½ more years, 6 more years for a female and 8 years for either spouse of a couple. Life expectancy has taken another significant decline from the beginning of the Middle Game. 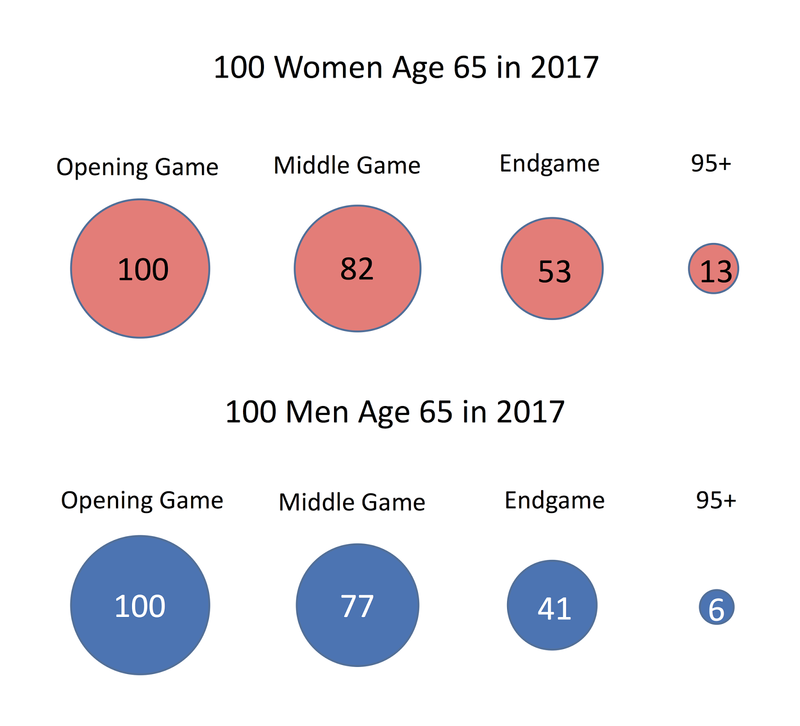 For every 100 women who begin the Opening Game in 2017 at age 65, about 53 will survive to play the Endgame and about 13 of those will likely live to 95 or older. For every 100 men, about 41 will survive to play the Endgame with about six reaching at least age 95. Our physical activity will typically follow another steep decline resulting in lower discretionary spending, but we are also likely to experience higher medical costs to offset the lower discretionary spending. Typical retiree expenses will decline about 25% after 20 years of retirement, but an individual household's spending may not be typical and even for those that are typical the spending doesn't decrease smoothly. In other words, spending over time is very difficult to predict for an individual household and it's even difficult to predict year-to-year. We may have lost significant mental acuity by the Endgame, though I have met people in this age group who are far sharper than I. Eventually, however, that mental acuity will likely begin to fade and we may no longer be able to manage our finances or have the desire to. We should anticipate this in our retirement plans. Investing in stocks just before and immediately following retirement (the Opening Game) exposes us to maximum probability of depleting our savings as a result of exposure to sequence of returns risk. 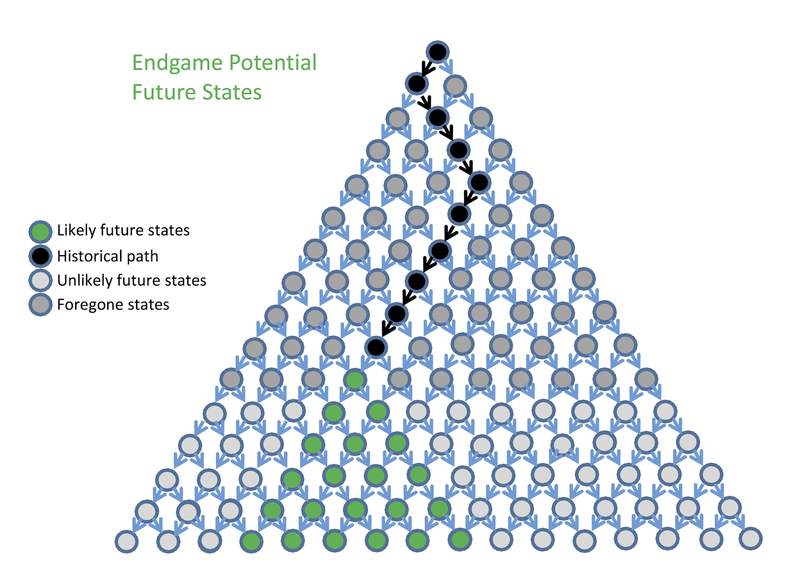 Investing in stocks in the Endgame can also be tricky because, though the probability of depleting our portfolio due to a poor sequence of returns has declined with a shorter life expectancy, we will now have limited time to recover from bear markets. Investing only those funds intended for our heirs, if that is possible, eliminates this problem. Investing funds we may need to live on is highly risky during this game. We had to claim Social Security benefits no later than age 70 (or more correctly I should say that delaying past 70 would have provided no additional advantage) back in the Opening Game. If we die before reaching median life expectancy for the age at which we claimed then we made a fortunate choice. Should we live longer, we would have been better off delaying the benefits claim. Regardless, our remaining lifetime was unpredictable and that decision was locked in during the Opening Game. HECM reverse mortgage  borrowers who spent home equity early in retirement may wish they had waited, but those who borrowed early and delayed spending may well find that their credit line now exceeds their home's market value. HECM borrowers who chose tenure payments may be well ahead of the game. Regardless, HECM borrowers may now need to deal with the transition out of the home, as the loan will become payable unless a surviving spouse still lives in the home. By the Endgame, purchasing a fixed annuity or Long Term Care insurance are no longer viable options. The number of elder bankruptcy filings becomes negligible in the Endgame . Though bankruptcies have generally declined across the board due to changes in bankruptcy law, the percentage of bankruptcies has been lower for those 75 and older for some time. The “Tax Torpedo”, as I discussed in a previous post, can become a long-term tax problem after age 70½ and will last until retirement account balances become low enough that RMDs no longer trigger higher Social Security benefit taxation. Sequence of returns risk is still a risk in the Endgame, but it may have declined significantly along with our life expectancy. (It's always a risk, but a shorter life expectancy makes it less likely that sequence risk will result in portfolio depletion.) Hopefully, the retiree has implemented a variable-spending strategy rather than having tried to spend a fixed percentage of initial savings each year. This will act to mitigate the risk of portfolio depletion over time. 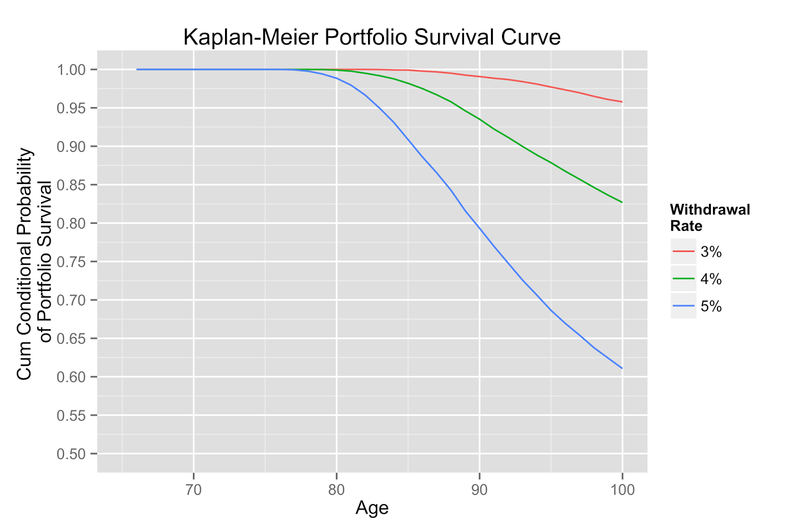 In my simulations, few retirees deplete their savings before the Middle Game (see Death and Ruin) but portfolio depletion accelerates at about age 85. The probability of outliving an investment portfolio is dependent upon the size of the portfolio, the percent of the portfolio spent annually, the portfolio's volatility, market returns, and the retiree's life expectancy. Because the retiree now needs to fund a retirement that will be on average half as long as the retiree in the Opening Game, his chances of outliving savings relative to his life expectancy have decreased (a good thing). On the other hand, a smaller portfolio than the retiree expected with which to begin the Endgame increases the probability of portfolio depletion (a bad thing) and, as I have stated repeatedly, we won't know how much money is left in our portfolio for the Endgame until we almost reach it. To say this differently, an older retiree with a shorter life expectancy can spend a larger percentage of his remaining portfolio value each year, but we can't predict the portfolio's future value. The question then becomes, "spend a larger percentage of what?" Regardless, for retirees who do reach the Endgame, fixed annuities, maximized Social Security benefits, and pensions will feel quite warm and cuddly. The range of possible remaining-lifetime spending costs of a shorter retirement is usually smaller (less risky) than that of a longer retirement. The monkey wrench in the spending machine is end-of-life costs, which can be huge or near zero. According to both Banerjee and Blanchett [2, 3], however, even yearly spending with high end-of-life costs are often lower than initial retirement spending in real dollars. We may think that end-of-life costs are a function of age but they are not. End-of-life costs don't appear in your nineties unless you live into your nineties. Lots of people die in the Opening and Middle Games and many of them will have high end-of-life costs. Actor Christopher Reeves had enormous end-of-life costs in his late forties. High end-of-life costs are a risk in all three games. They are a function of when you die and not necessarily one of age. Remaining life expectancy, mental acuity, decreasing options, and the unavoidable effects of Opening and Middle Game decisions make this a different game. The best strategy for the End Game can't be determined until the Middle Game is nearly over because we won't know until then what market returns, interest rates, and life have done to our resources and our cost of living. This series of posts was not intended as a comprehensive comparison of the three games. I have only tried to establish that retirement resources, options and challenges are different enough for a 65-year old, a 75-year old and an 85-year old to warrant perhaps three separate strategies. Our Endgame will be affected both by immediate financial decisions we make or others make for us but also by decisions we made a decade or two earlier. This is why we need to begin retirement by, as Stephen Covey says, "starting with the end in mind." Both our time and our mental acuity will likely be shortened by the Endgame. Our resources may be dwindling and that leaves the Endgame particularly fraught. The Mortgage is Dead; Long Live the (Reverse) Mortgage, Cotton, D., The Retirement Cafe blog. Banerjee, S. (2012). Expenditure patterns of older Americans, 2001-2009. Blanchett, D. (2013, November 5). Estimating the True Cost of Retirement. Morningstar.